Cardtronics, the UK's biggest independent cash machine operator, is planning to cut back its network because of a shake-up in the industry. The company operates about 20,000 machines in the UK, mostly in pubs, local shops and garage forecourts. But Link, the UK's biggest cash machine network, is seeking to reduce the amount it charges card issuers to allow customers to use the machines. 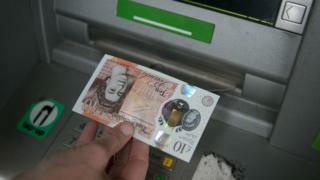 Cardtronics says the move could make free-to-use ATMs "unsustainable". Under proposals published in November, Link would reduce interchange fees paid by card issuers such as banks and building societies to cash machine operators from about 25p to 20p per withdrawal. This would happen over a four-year period. Cardtronics UK would not confirm the number of machines affected, but it has been reported to be almost 1,500. In a statement, Cardtronics UK said: "We can confirm that there are specific plans to close some of our machines due to the prospect of lower Link interchange payments as early as next year, combined with rising cost pressures which include the recent introduction of polymer notes, the need for software upgrades as well as increasing crime prevention and other compliance costs. "Should Link's proposals to slash interchange be implemented in their entirety, the free-to-use ATM model in the UK will become unsustainable and Cardtronics UK will be forced to convert a much more significant number of currently viable free-to-use ATMs to pay-to-use or even remove ATM sites altogether. "This will be especially true for rural communities, where operating costs are often higher than in densely populated urban areas, regardless of the type of location, be that pubs, local shops or street kiosks. Link has said the plans, which would come into effect next April, will help retain an extensive network of free cash machines for consumers. It says there will be fewer machines, but only in areas where there are already a large number. A spokesmen said: "Five thousand ATMs have been added to the national network in three years, but 80% are within 300m of each other. "We want to make sure ATMs are in places where they are needed and will strengthen subsidies in areas where ATMs are economically unviable." But MPs and consumer groups have raised concerns about the impact it will have, especially after hundreds of bank branch closures in the past year. The chair of the Commons Treasury committee, Nicky Morgan, has written to the head of the Link network asking what assurances can be provided that the proposals will preserve the existing geographical spread of cash machines. Consumer group Which? said that last year, 2.7 million people in the UK were entirely reliant on cash. It has written to the Payment Systems Regulator asking it to step in and conduct an urgent review on how consumers will be affected. Ron Delnevo, Europe executive director of the ATM Industry Association, is meeting with members of the Treasury committee today to press for an inquiry. He is concerned that 6,000 to 8,000 bank cash machines could be lost by 2020. He said: "We are very concerned. Many communities have lost their High Street banks and now they are being faced with losing access to free cash machines. "It will hit the poorest hardest."